September 17 is an important date for people of the Jewish faith as it is the holy day known as Rosh Hashanah. The holiday signifies the first High Holy Day of the Jewish New Year. During this spiritual gathering, families will come together to read from the Torah about the creation of the world. During the celebration, families will feast on two loafs of challah bread that symbolize a crown and the kingship of God. This bread also stands for the circle of life and the hope that life endures without end, FactMonster.com reports. Other popular fare eaten during this holy day is apples dipped in honey, fish and a mixture known as tzimmes, consisting of cinnamon, yams, prunes and honey. For families hosting the kick off of the High Holy days this season, a great way to add some flair to the event is with beautiful flower centerpieces. 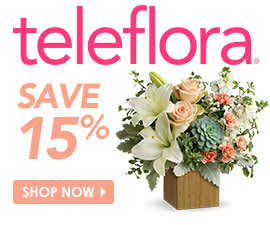 An arrangement like Teleflora's Seaside Centerpiece may be the perfect selection. This collection of beautiful blue hydrangea, delphinium and creme roses come in a stunning antique silver-flecked glass vase that is sure to impress guests in attendance.